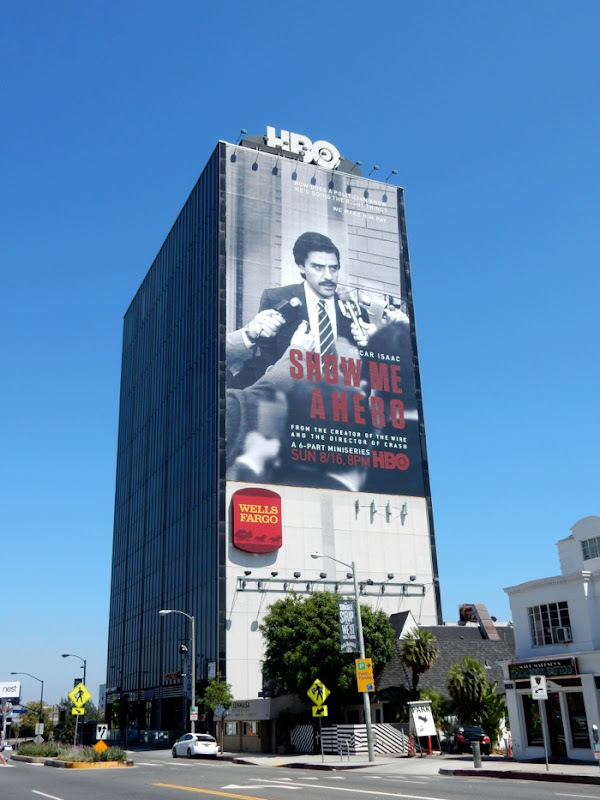 Get used to this face people, because Daily Billboard is sure it's not the last time we'll see the actor super-sized in the skies for a role in the coming months. 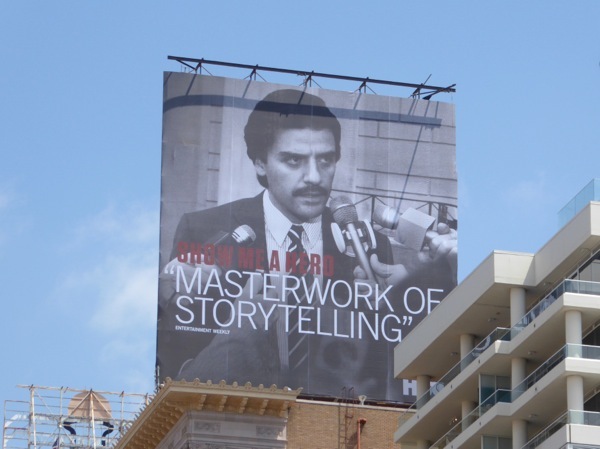 You may already know Oscar Isaac from films like Inside Llewyn Davis, A Most Violent Year and the wonderful Ex Machina, but he'll soon be exploding onto cinema screens in the new Star Wars: The Force Awakens as the heroic X-Wing pilot 'Poe Dameron' and as the big bad mutant villain in X-Men: Apocalypse. 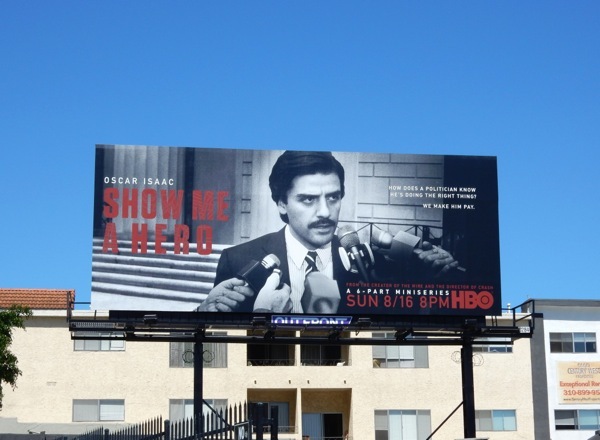 Next you can catch him in the six-part HBO original mini-series, Show Me a Hero, based on the true events depicted in Lisa Belkin's 1999 nonfiction book of the same name and directed by Paul Haggis (Crash). 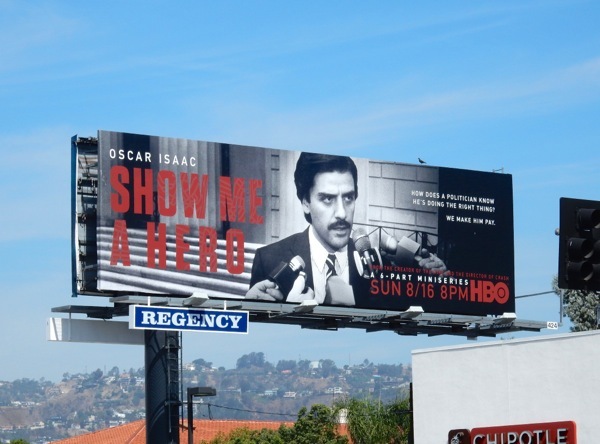 Taking place from 1987 to 1994, he plays 'Nick Wasicsko', a former police officer and then Yonkers City Council member who eventually became the youngest big city mayor in the U.S. 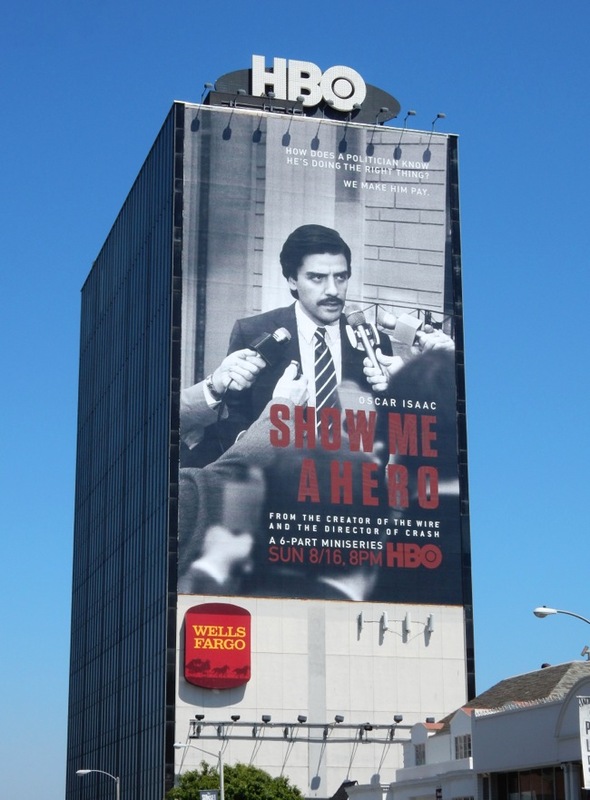 The story focuses on a federally-mandated project designed to desegregate public housing in Yonkers, New York by building low-income housing in predominantly white, middle-class neighbourhoods, which led to city-wide tensions fueled by fear, racism and politics, and ultimately led to the downfall of the mayor. 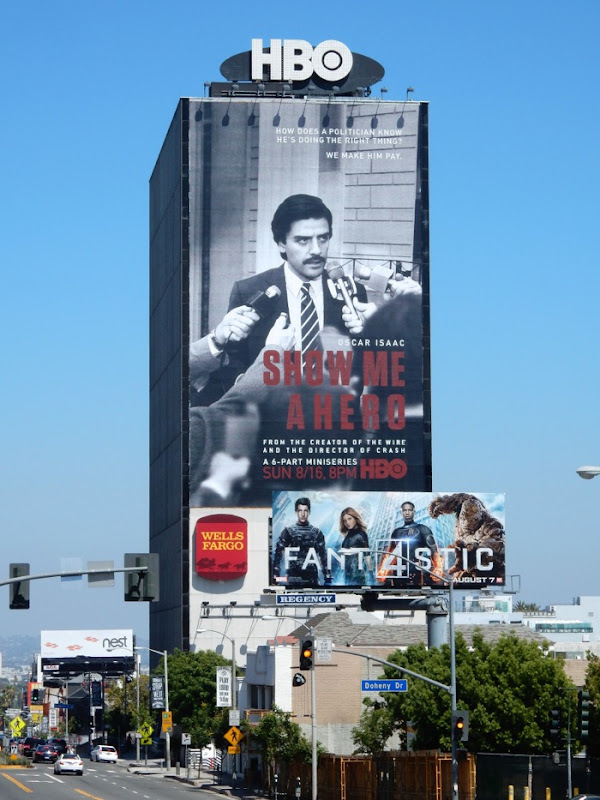 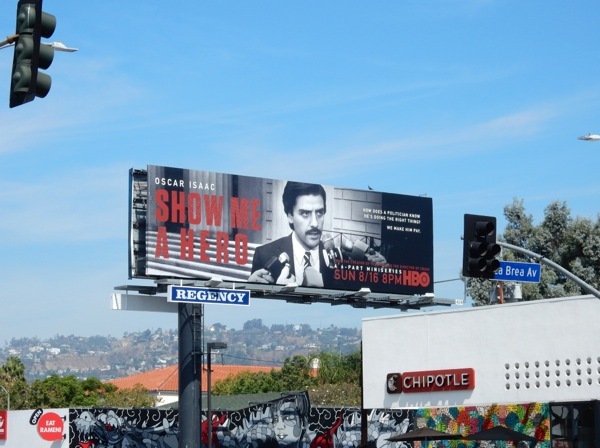 The giant-sized billboard for Show Me a Hero was snapped towering over eastbound Sunset Strip on August 2, whilst the standard landscape billboard was spotted along Melrose Avenue the next day, and a larger landscape ad was photographed along Santa Monica Boulevard in West L.A. on August 8, 2015. 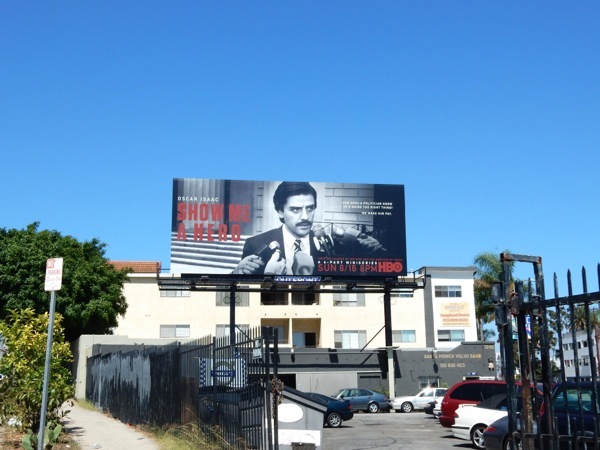 In politics it seems the more things change, the more they stay the same. 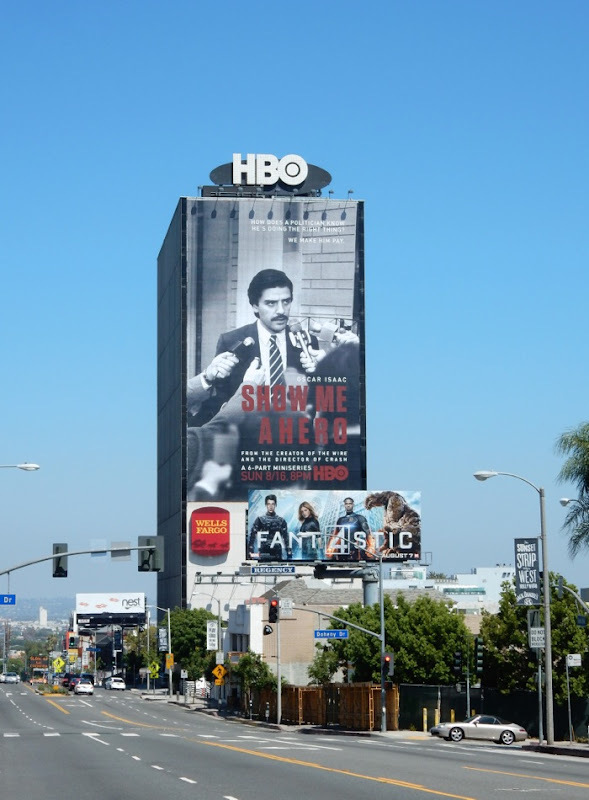 UPDATED: Here's also the Emmy consideration billboard for the HBO mini-series spied high over Hollywood's Sunset & Vine on May 26, 2016.